Oxidative stress has been implicated in the pathogenesis of inflammatory diseases of airways. Here we show that oxidative stress causes ligand-independent activation of epidermal growth factor receptors (EGFR) and subsequent activation of mitogen-activated protein kinase kinase (MEK)-p44/42 mitogen-activated protein kinase (p44/42mapk), resulting in mucin synthesis in NCI-H292 cells. Exogenous hydrogen peroxide and neutrophils activated by IL-8, FMLP, or TNF-α increased EGFR tyrosine phosphorylation and subsequent activation of p44/42mapk and up-regulated the expression of MUC5AC at both mRNA and protein levels in NCI-H292 cells. These effects were blocked by selective EGFR tyrosine kinase inhibitors (AG1478, BIBX1522) and by a selective MEK inhibitor (PD98059), whereas a selective platelet-derived growth factor receptor tyrosine kinase inhibitor (AG1295), a selective p38 MAPK inhibitor (SB203580), and a negative compound of tyrosine kinase inhibitors (A1) were without effect. Neutrophil supernatant-induced EGFR tyrosine phosphorylation, activation of p44/42mapk, and MUC5AC synthesis were inhibited by antioxidants (N-acetyl-l-cysteine, DMSO, dimethyl thiourea, or superoxide dismutase); neutralizing Abs to EGFR ligands (EGF and TGF-α) were without effect, and no TGF-α protein was found in the neutrophil supernatant. In contrast, the EGFR ligand, TGF-α, increased EGFR tyrosine phosphorylation, activation of p44/42mapk, and subsequent MUC5AC synthesis, but these effects were not inhibited by antioxidants. These results implicate oxidative stress in stimulating mucin synthesis in airways and provide new therapeutic approaches in airway hypersecretory diseases. Reactive oxygen species (ROS),3 such as superoxide anion (O2−), hydrogen peroxide (H2O2), and hydroxyl radical (·OH), are generated in cells as by-products of electron transfer reactions and arachidonic acid metabolism (1, 2). Elevated levels of ROS, reflecting oxidative stress, is observed in many acute pathophysiological states, including sepsis, exposure to ionizing radiation, ischemia and reperfusion, and other inflammatory conditions such as acute asthma (3, 4). Oxidative stress is also thought to play a role in many chronic pathophysiological states, including airway inflammatory disease, e.g., chronic obstructive pulmonary disease (5), bronchiectasis (6), and cystic fibrosis (7, 8). These diseases are characterized by accumulation of activated neutrophils, which may cause oxidative damage to DNA (1, 9) that leads to the destruction of airway epithelial cells (10), resulting in lung injury. Although oxidative stress has cytotoxic effects, studies have also indicated that ROS mediate a number of adaptive biologic responses (11, 12): Oxidative stress secondary to H2O2 exposure may induce apoptosis in bovine airway epithelial cells (13), but H2O2 also modulates the expression of a variety of genes that are involved in immune and inflammatory responses (14). The regulation of gene expression by oxidative stress involves numerous signaling pathways including mitogen-activated protein kinase (MAPK) triggered by receptor tyrosine kinases such as platelet-derived growth factor receptor (PDGFR) (15) and epidermal growth factor receptor (EGFR) (16, 17). Thus, chronic exposure to low levels of ROS may cause abnormal cell growth and differentiation. Hypersecretory diseases of airways are associated with abnormal cell growth and differentiation in mucus-synthesizing cells including submucosal gland hypertrophy and goblet cell hyperplasia. Recently, mucin synthesis in airways has been reported to be regulated by the EGFR system (18); activation of EGFR tyrosine kinase by its ligands leads to the synthesis of mucin MUC5AC, a major mucin in airways (19, 20), at both mRNA and protein levels, resulting in goblet cell hyperplasia in rats. However, the mechanisms of EGFR activation in airways are unknown. In airways, EGFR activation may be caused by oxidative stress that is induced by activated neutrophils, and this activation of EGFR may result in stimulation of mucin synthesis in airways. To test this hypothesis, we examined whether exogenous or neutrophil-derived oxidative stress causes mucin MUC5AC synthesis, and, if so, whether EGFR activation is involved. Here we show that oxidative stress induces mucin synthesis in airway epithelial cells via ligand-independent EGFR activation that leads to activation of the MAPK kinase (MEK)-p44/42mapk signal transduction pathway. Thus, neutrophils may play important roles in the overproduction of mucins in airway diseases via an EGFR cascade. Human neutrophils were purified from peripheral blood obtained from healthy human donors. Neutrophil isolation was performed by standard techniques of Ficoll-Hypaque gradient separation, dextran sedimentation, and hypotonic lysis of erythrocytes. Cells were routinely >95% viable by trypan blue dye exclusion. To prevent endotoxin contamination, all solutions were passed through a 0.1-μm filter. NCI-H292 cells, a human pulmonary mucoepidermoid carcinoma cell line, were grown in RPMI 1640 medium containing 10% FBS, penicillin (100 U/ml), streptomycin (100 μg/ml), and HEPES (25 mM) at 37°C in a humidified 5% CO2 water-jacketed incubator. 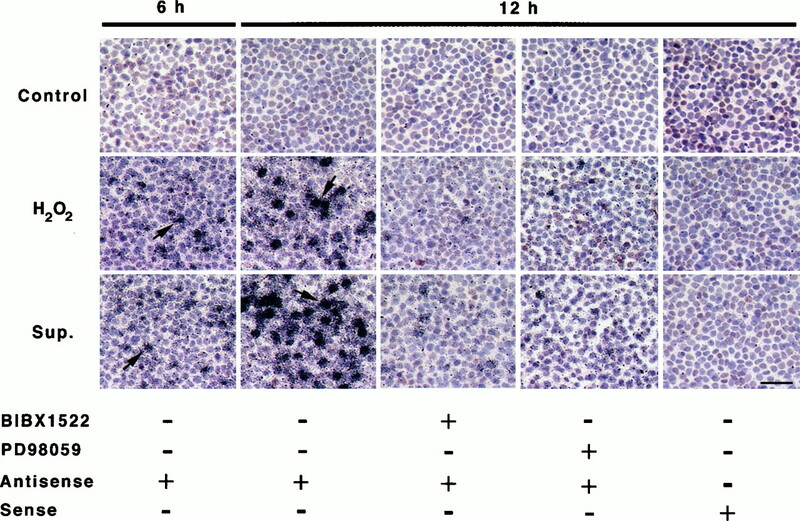 When confluent, cells were incubated for 1 h with neutrophils (106 cells/ml) alone, TNF-α alone (human rTNF-α, 5–20 ng/ml; Genzyme, Cambridge, MA), IL-8 (human rIL-8, 10−9–10−7 M; Genzyme) alone, FMLP (10−9–10−7 M; Sigma, St. Louis, MO) alone, TNF-α plus neutrophils, IL-8 plus neutrophils, FMLP plus neutrophils, H2O2 (10–400 μM), or TGF-α (human rTGF-α, 0.1–25 ng/ml; Calbiochem, San Diego, CA). The cells were then washed and incubated with fresh medium alone. Experiments were terminated at preselected times (for mRNA, 6 h and 12 h; for protein, 24 h). As controls, cells were incubated with medium alone for the same time periods. In other studies with neutrophils, TNF-α was chosen as the stimulus because preliminary studies showed that TNF-α had the most potent effect on MUC5AC synthesis. To further analyze the mechanism by which neutrophils induce MUC5AC synthesis, neutrophils were incubated with TNF-α (20 ng/ml) for 1 h in the same medium that was used for the incubation of NCI-H292 cells. After 1 h incubation, the medium (supernatant) was separated from the neutrophils. A medium that was on top of NCI-H292 cells was aspirated and replaced immediately with either the same volume of supernatant or of the activated neutrophils that were washed with sterile PBS to avoid contamination with the supernatant (e.g., molecules released from neutrophils), and resuspended with the same volume of fresh medium. In inhibition studies with tyrosine kinase inhibitors, NCI-H292 cells were pretreated with BIBX1522 (a selective inhibitor of EGFR tyrosine kinase, 10 μM; generously provided by Boehringer Ingelheim, Ingelheim, Germany), tyrphostin AG1478 (selective inhibitor of EGFR tyrosine kinase, 10 μM), tyrphostin AG1295 (a selective inhibitor of PDGFR tyrosine kinase, 100 μM), tyrphostin A1 (a negative control for tyrphostins, 100 μM), PD98059 (a selective MEK inhibitor, 30 μM), and SB203580 (a specific inhibitor of p38 MAPK, 2 μM) 30 min before adding a stimulus. All tyrosine kinase inhibitors were purchased from Calbiochem. In inhibition studies with blocking Abs to EGFR ligands, the supernatants were pretreated with anti-TGF-α Ab (Ab-3, 2 μg/ml; Calbiochem) or anti-EGF Ab (Ab-3, 2 μg/ml; Calbiochem) for 30 min and then added to NCI-H292 cells. The role of oxygen free radicals was examined using N-acetyl-l-cysteine (20 mM), oxygen free radical scavengers (DMSO (1%, Sigma) or 1,3-dimethyl-2-thiourea (DMTU, 50 mM, Sigma)), or superoxide dismutase (SOD, 300 U/ml, Sigma). The concentrations were determined from previous studies (17, 21, 22, 23, 24). Cells were serum-starved for 24 h and then stimulated with H2O2, with the supernatant of activated neutrophils, or with TGF-α for 15, 30, and 60 min. After stimulation, cells were lysed with lysis buffer (20 mM sodium phosphate, pH 7.8, 150 mM NaCl, 5 mM EDTA, 50 mM HEPES, 1% Triton X-100, 50 mM NaF, 1 mM sodium orthovanadate, 5 mM PMSF, and 10 μg/ml each of leupeptin and aprotinin) and incubated for 30 min at 4°C. To remove insoluble materials, cell lysates were centrifuged at 14,000 rpm for 5 min at 4°C. Aliquots of supernatants containing equal amounts of protein were suspended in SDS sample buffer and boiled for 5 min. Proteins were separated by SDS-PAGE in 4–15% acrylamide gel. The resulting gel was equilibrated in the transfer buffer: 25 mM Tris-HCl, 192 mM glycine, 20% (v/v) methanol, pH 8.3. The proteins were then transferred electrophoretically to nitrocellulose membranes, which were incubated with 5% fat-free skimmed milk in PBS containing 0.05% Tween 20 for 1 h and then incubated with anti-phospho-specific EGFR mAb (2 μg/ml; Calbiochem) or anti-phospho-p44/42mapk mAb (2 μg/ml; New England Biolabs, Beverly, MA) overnight. Bound Ab was visualized according to a standard protocol for the avidin-biotin-alkaline phosphatase complex method (ABC kit; Vector Laboratories, Burlingame, CA). At the end of each experiment, the cells grown on 8-chamber slides were fixed with 4% paraformaldehyde for 1 h and then either stained with Alcian blue/periodic acid-Schiff (PAS) to visualize mucous glycoconjugates or used for immunocytochemistry of MUC5AC. For immunocytochemistry of MUC5AC, PBS containing 0.05% Tween 20, 2% normal goat serum, and levamisol (2 mM) was used as diluent for the Ab. Cells were incubated with a mouse mAb to MUC5AC (clone 45 M1, 1:200; Neo Markers, Fremont, CA) for 1 h at room temperature, and then washed three times with PBS to remove excess primary Ab. Cells were then incubated with biotinylated horse anti-mouse IgG (Vector Laboratories) at 1:200 dilution for 1 h at room temperature. Bound Ab was visualized according to a standard protocol for the avidin-biotin-alkaline phosphatase complex method. A 298-bp cDNA fragment of human MUC5AC (generously provided by Dr. Carol Basbaum, University of California, San Francisco) was inserted into TA cloning vector (Invitrogen, San Diego, CA). The preparation of RNA probes and in situ hybridization were performed as described previously (25). MUC5AC protein was measured as described previously (18). In brief, cell lysates were prepared with PBS at multiple dilutions, and 50 μl of each sample was incubated with bicarbonate-carbonate buffer (50 μl) at 40°C in a 96-well plate (Maxisorp Nunc, Fisher Scientific, Santa Clara, CA), until dry. Plates were washed three times with PBS and blocked with 2% BSA, fraction V (Sigma) for 1 h at room temperature. Plates were again washed three times with PBS and then incubated with 50 μl of MUC5AC mAb (1:100) that was diluted with PBS containing 0.05% Tween 20. After 1 h, the wells were washed three times with PBS, and 100 μl HRP-goat anti-mouse lgG conjugate (1:10,000) was dispensed into each well. After 1 h, plates were washed three times with PBS. Color reaction was developed with 3,3′,5,5′-tetramethylbenzidine peroxidase solution (Kirkegaard & Perry Laboratories, Gaithersburg, MD) and stopped with 2 N H2SO4. Absorbance was read at 450 nm. TGF-α protein was measured using a commercially available kit for ELISA (Calbiochem), following the manufacturer’s instructions. Supernatant taken after incubation of neutrophils plus TNF-α (20 ng/ml) for 1 h was mixed with the lysis buffer PBS containing 1% Triton X-100, 1% sodium deoxycholate, and several protease inhibitors (Complete Mini; Boehringer Mannheim, Mannheim, Germany), and then used to measure TGF-α. All data are expressed as mean ± SEM. One-way ANOVA was used to determine statistically significant differences between groups. Scheffe’s F test was used to correct for multiple comparisons when statistical significances were identified in the ANOVA. A probability of <0.05 for the null hypothesis was accepted as indicating a statistically significant difference. It has been reported that NCI-H292 cells express MUC5AC protein in the resting condition (18). Addition of H2O2 to the cells increased MUC5AC protein synthesis in a dose-dependent fashion; the maximum synthesis of MUC5AC protein occurred at 200 μM of H2O2 (Fig. 1⇓). Dose-dependent effect of H2O2 on MUC5AC protein synthesis in NCI-H292 cells. Addition of H2O2 increased MUC5AC protein synthesis dose-dependently (n = 5 for each point; ∗, p < 0.05, significantly different from control). Because neutrophils are known to cause oxidative stress when they are activated by stimuli that activate neutrophils (9, 26, 27, 28, 29, 30), the effect of activated neutrophils on MUC5AC synthesis was tested in NCI-H292 cells. Neutrophils plus activating stimuli (IL-8, FMLP, TNF-α) incubated with NCI-H292 cells for 1 h caused increased MUC5AC protein synthesis within 24 h in a dose-dependent manner, whereas nonactivated neutrophils (106/ml), IL-8 alone, or FMLP alone had no effect; incubation with TNF-α alone caused a small, insignificant increase in MUC5AC synthesis (Fig. 2⇓). When neutrophils were preincubated for 1 h with TNF-α and then the neutrophils and their supernatant were separated, subsequent incubation of the supernatant for 1 h with NCI-H292 cells increased MUC5AC protein synthesis significantly; neutrophils separated from the supernatant after incubation were without effect (Fig. 2⇓). We conclude that activated neutrophils rapidly secrete an active product, which causes MUC5AC synthesis. Effect of incubation of neutrophils and/or stimuli to neutrophils (IL-8, FMLP, and TNF-α) on MUC5AC protein synthesis. MUC5AC protein was measured as described in Materials and Methods. 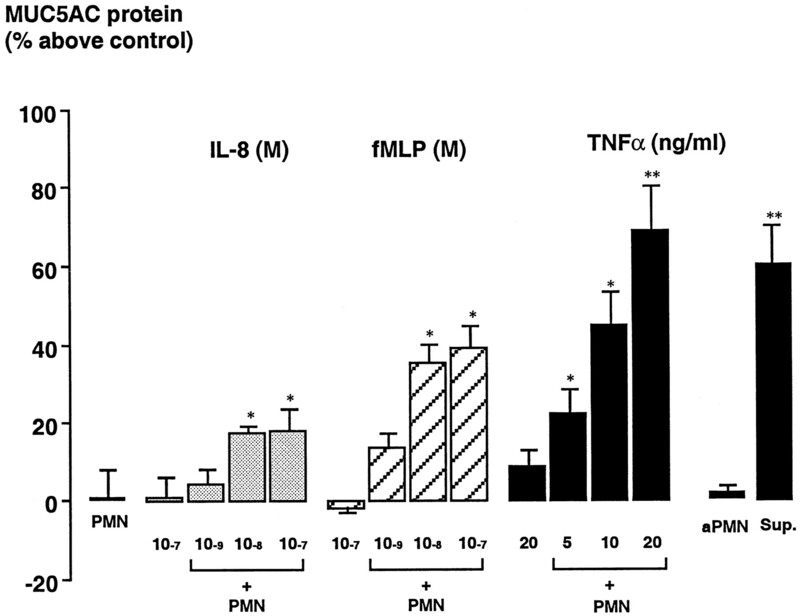 The combination of neutrophils (PMN) and stimuli (in brackets) caused significant increases in MUC5AC protein synthesis dose-dependently, but PMN, IL-8, FMLP, or TNF-α alone (no brackets) did not stimulate MUC5AC protein synthesis. Neutrophils were incubated with TNF-α for 1 h, and then either the activated neutrophils (aPMN) that were washed with PBS or the neutrophil supernatant (Sup.) was added to NCI-H292 cells (far right columns). Sup. increased MUC5AC protein synthesis markedly, whereas the aPMN were without effect (n = 5; ∗, p < 0.05; ∗∗, p < 0.01, significantly different from control). Resting neutrophils showed only a weak cytoplasmic staining with both Alcian blue/PAS and anti-MUC5AC Ab. Addition of H2O2 or supernatant of activated neutrophils to the cells increased the cytoplasmic staining for MUC5AC protein in a pattern similar to Alcian blue/PAS staining (Fig. 3⇓). The staining pattern with both Alcian blue/PAS and anti-MUC5AC Ab showed a patchy distribution (similar to the pattern of MUC5AC mRNA, Fig. 4⇓) when H2O2 or supernatant of activated neutrophils was added, although all of cells showed increased staining in their cytoplasm. Alcian blue/PAS staining of NCI-H292 cells for identification of mucous glycoconjugates (left) and immunocytochemical analysis for MUC5AC protein (right). Immunocytochemical analysis with an anti-MUC5AC Ab showed positive staining in only a few cells in the control state (Cont) in a pattern similar to that of Alcian blue/PAS staining. However, addition of either H2O2 (200 μM) or supernatant of activated neutrophils (Sup.) increased both the Alcian blue/PAS staining and MUC5AC protein in the cytoplasm of the cells; some cells showed markedly increased staining (arrows). Cells incubated with isotype control Ab or without primary Ab were negative. Results were representative of three separate experiments. Bar, 50 μm. In situ hybridization for MUC5AC mRNA in NCI-H292 cells. Control (medium alone) showed a low level of expression of MUC5AC mRNA at 6 and 12 h. However, the expression of MUC5AC mRNA (arrows) was up-regulated by addition of H2O2 (200 μM) or of supernatant of activated neutrophils (Sup., details in Materials and Methods) within 6 h and accentuated at 12 h. Pretreatment with either a selective EGFR tyrosine kinase inhibitor (BIBX1522) or a selective MEK inhibitor (PD98059) prevented the MUC5AC mRNA expression up-regulated by H2O2 and by Sup. Sense probe for MUC5AC showed no expression of MUC5AC in all conditions. Three different experiments showed similar results. Bar, 50 μm. Resting NCI-H292 cells showed little expression of MUC5AC mRNA at both 6 and 12 h. Addition of H2O2 or supernatant of activated neutrophils to the cells up-regulated MUC5AC mRNA expression within 6 h and accentuated at 12 h (Fig. 4⇑). The intense expression of MUC5AC mRNA was found in certain cells and thus showed a patchy distribution of the expression. The sense probe of MUC5AC showed no expression (Fig. 4⇑). Because EGFR tyrosine kinase activation causes MUC5AC synthesis, activation of EGFR tyrosine kinase was examined. The EGFR ligand, TGF-α, increased EGFR-specific tyrosine phosphorylation in NCI-H292 cells. H2O2 and supernatant of activated neutrophils also increased EGFR-specific tyrosine phosphorylation, but to a lesser extent (Fig. 5⇓). EGFR tyrosine phosphorylation induced by H2O2 or by supernatant of activated neutrophils was approximately one-third of that induced by TGF-α. Because activation of MAPK plays an important role in gene transcription of many mammalian cells and is known to be downstream of the EGFR signaling pathway, we tested whether p44/42mapk was phosphorylated in this system. Similar to EGFR phosphorylation, TGF-α increased p44/42mapk phosphorylation in NCI-H292 cells. Both H2O2 and supernatant of activated neutrophils also increased p44/42mapk phosphorylation. The peak of phosphorylation of p44/42mapk induced by H2O2 and by supernatant of activated neutrophils was slower than phosphorylation induced by TGF-α (data not shown). Pretreatment of NCI-H292 cells with BIBX1522 inhibited both EGFR tyrosine phosphorylation and p44/42mapk phosphorylation (Fig. 5⇓B), whereas PD98059 had no effect on EGFR tyrosine phosphorylation, but it inhibited p44/42mapk phosphorylation induced by H2O2, by supernatant of activated neutrophils, and by TGF-α (Fig. 5⇓A). N-acetyl-l-cysteine inhibited EGFR tyrosine phosphorylation induced by H2O2 and by supernatant of activated neutrophils but had no effect on TGF-α-induced EGFR tyrosine phosphorylation (Fig. 5⇓C). Tyrosine phosphorylation of EGFR and p44/42mapk induced by supernatant of activated neutrophils (Sup., details in Materials and Methods), by H2O2, and by TGF-α. NCI-H292 cells were incubated under each of these conditions for 30 min and lysed. 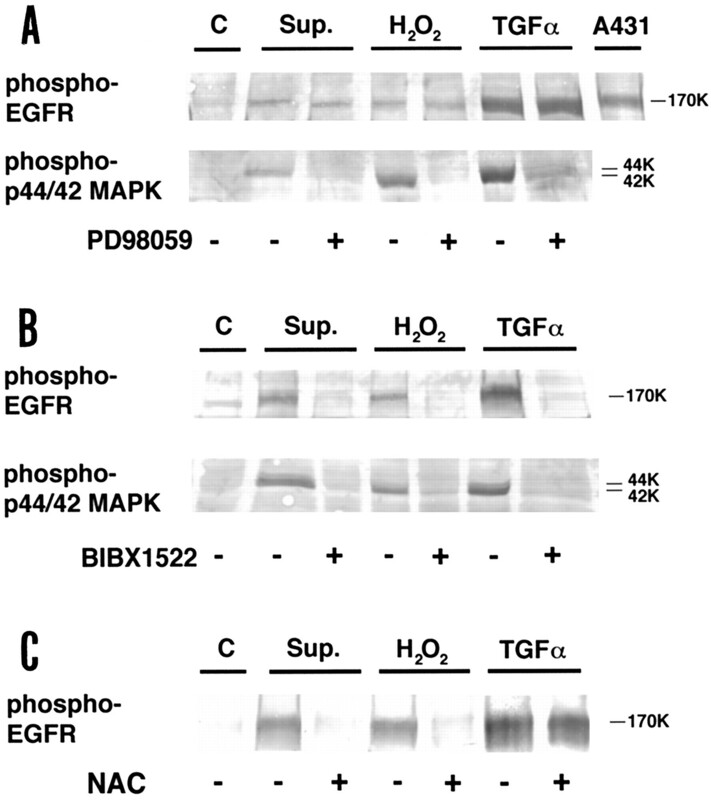 Proteins were separated by SDS-PAGE in 4–15% acrylamide gel and blotted with anti-phospho-specific EGFR Ab or with anti-phospho- p44/42mapk Ab. In inhibition studies, NCI-H292 cells were pretreated with a selective EGFR tyrosine kinase inhibitor (BIBX1522), a selective MEK inhibitor (PD98059), or with N-acetyl-l-cysteine for 30 min. Sup. and H2O2 induced an increase in tyrosine phosphorylation both of EGFR and of p44/42mapk in NCI-H292 cells. BIBX1522 inhibited the tyrosine phosphorylation at both sites (B), whereas PD98059 had no effect on EGFR tyrosine phosphorylation (A). N-acetyl-l-cysteine inhibited both Sup.- and H2O2-induced EGFR tyrosine phosphorylation, whereas it had no effect on TGF-α-induced EGFR tyrosine phosphorylation (C). Results were representative of three separate experiments. Because both H2O2 and supernatant of activated neutrophils increased EGFR tyrosine phosphorylation and p44/42mapk phosphorylation, the effects of inhibitors of EGFR tyrosine phosphorylation and of MEK were tested on MUC5AC synthesis. Pretreatment of NCI-H292 cells with selective EGFR tyrosine kinase inhibitors (BIBX1522, AG1478) or a MEK inhibitor (PD98059) prevented the MUC5AC synthesis at both mRNA (Fig. 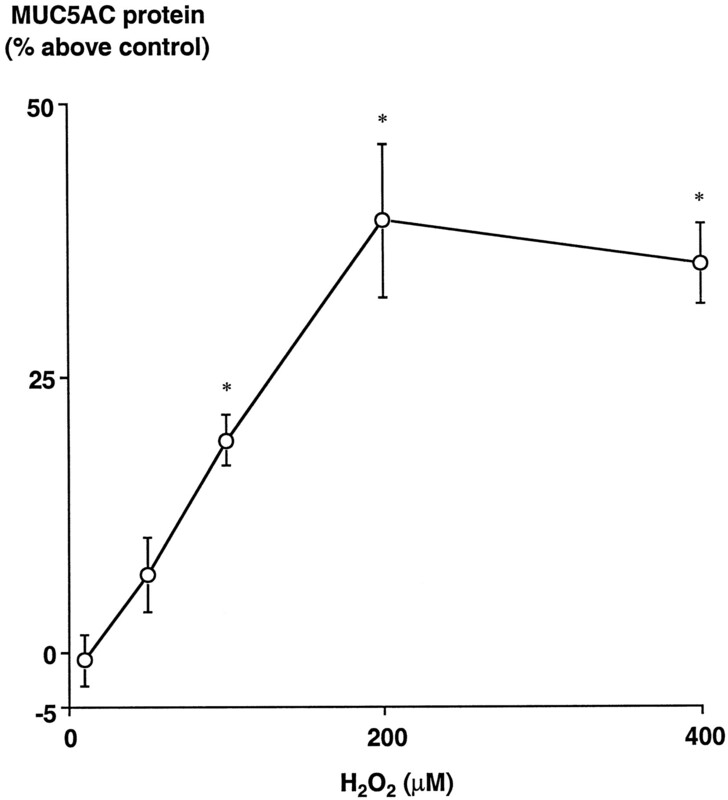 4⇑) and protein levels (Fig. 6⇓) that were usually induced by H2O2 and by supernatant of activated neutrophils. A selective tyrosine kinase inhibitor of PDGFR (AG1295), a selective inhibitor of p38 MAPK, SB203580, and a negative control for tyrphostins (A1) were without effect (Fig. 6⇓). Effect of tyrosine kinase inhibitors on MUC5AC protein synthesis induced by supernatant of activated neutrophils (Sup. ), H2O2, and TGF-α in NCI-H292 cells. 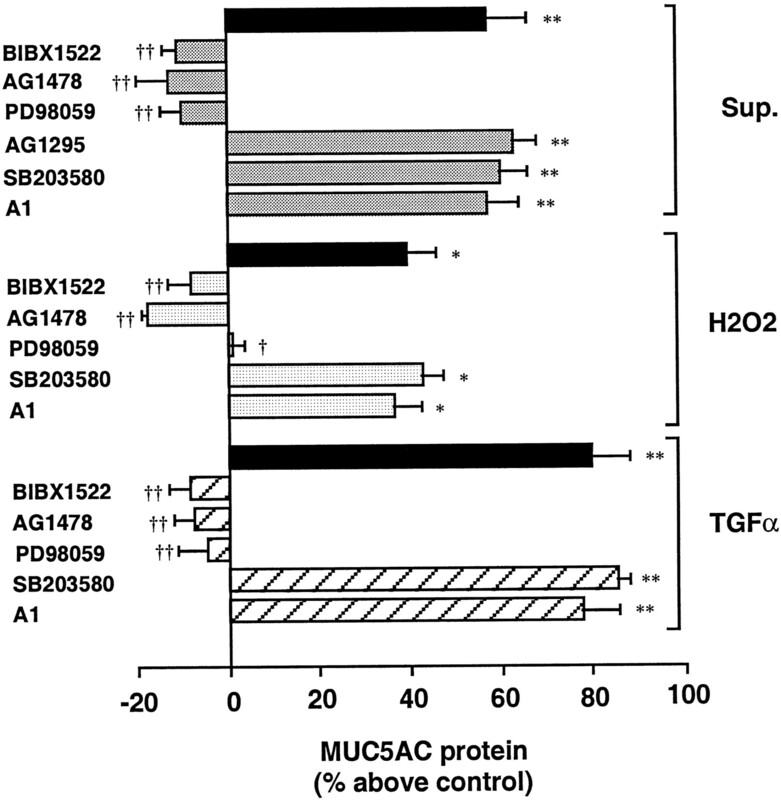 Sup.-, H2O2-, and TGF-α-induced MUC5AC synthesis were inhibited by selective EGFR tyrosine kinase inhibitors (BIBX1522, 10 μM; AG1478, 1 μM) and by a selective MEK inhibitor (PD98059, 30 μM), whereas a selective PDGFR kinase inhibitor (AG1295, 30 μM), a specific inhibitor of p38 MAPK (SB203580, 20 μM), and a negative control (tyrphostin A1, 30 μM) were without effect. (n = 5; ∗, p < 0.05; ∗∗, p < 0.01, significantly different from control, †, p < 0.05; ††, p < 0.01, significantly different from response to each stimulus alone). To determine whether activation of EGFR tyrosine kinase is dependent on EGFR ligands (EGF and TGF-α), we preincubated the supernatant of activated neutrophils with neutralizing Abs to EGFR ligands. Pretreatment of the supernatant with either an anti-TGF-α Ab or with an anti-EGF Ab did not inhibit MUC5AC synthesis induced by the supernatant of activated neutrophils (Fig. 7⇓). Furthermore, TGF-α was not detected in the supernatant (data not shown). Thus, EGFR tyrosine phosphorylation caused by the supernatant of activated neutrophils was induced by a mechanism independent of the EGFR ligands, EGF and TGF-α. Effect of antioxidants or neutralizing Abs to EGFR ligands on MUC5AC protein synthesis induced by supernatant of activated neutrophils (Sup. ), H2O2, and TGF-α in NCI-H292 cells. 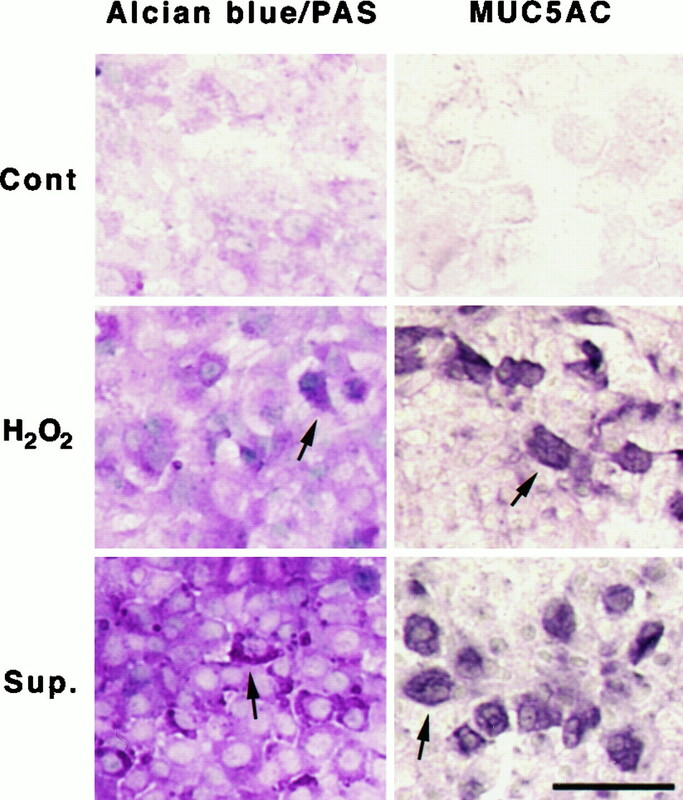 Sup.- and H2O2-induced MUC5AC synthesis were inhibited by antioxidants (N-acetyl-l-cysteine, 20 mM; DMSO, 1%; DMTU, 50 mM; SOD, 300 U/ml), whereas neutralizing Abs to EGFR ligands had no effect (n = 5; ∗, p < 0.05; ∗∗, p < 0.01, significantly different from response to each stimulus alone). In contrast, antioxidants had no effect on TGF-α-induced MUC5AC synthesis (hatched columns). 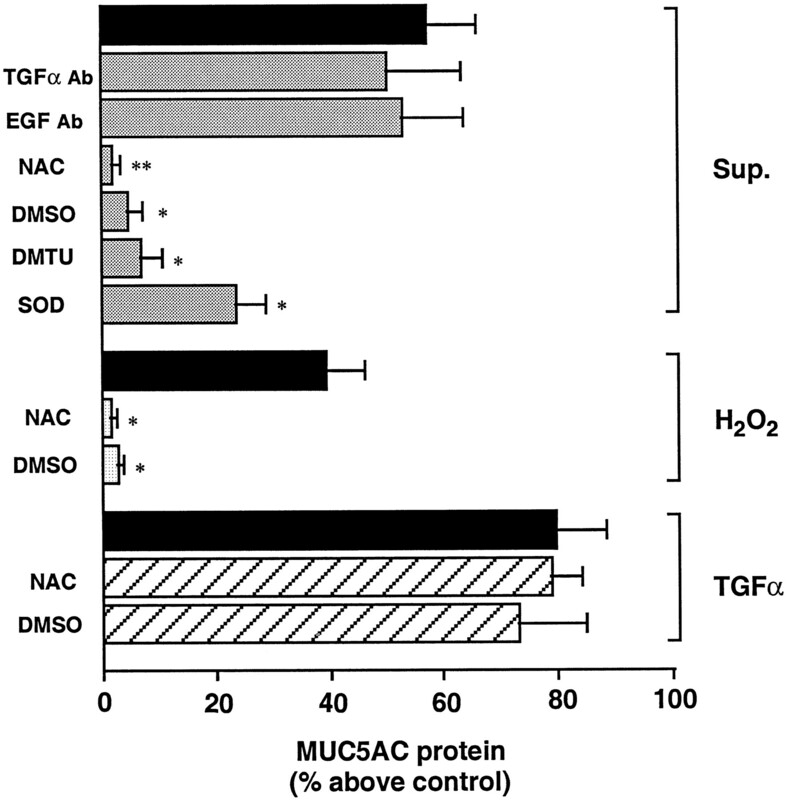 MUC5AC synthesis by H2O2 or by supernatant of activated neutrophils was inhibited by pretreatment with N-acetyl-l-cysteine, by free radical scavengers (DMSO and DMTU), and by SOD, but MUC5AC protein synthesis by TGF-α was unaffected by antioxidants (Fig. 7⇑). In the present study, we addressed the question whether oxidative stress induces mucin MUC5AC synthesis in airway epithelial cells. Our results showed that addition of H2O2 up-regulated mucin MUC5AC mRNA expression and subsequent MUC5AC protein synthesis in NCI-H292 cells in a dose-dependent manner. Similarly, neutrophils, a major source of oxidative stress in disease, also caused mucin MUC5AC synthesis when activated by IL-8, FMLP, or TNF-α. TNF-α had the greatest effect, and this is compatible with the potent release of oxidants from neutrophils by TNF-α (9, 26, 27, 28, 29, 30). To examine whether neutrophils release mediators that cause mucin synthesis, the supernatant was separated from the neutrophils after 1 h incubation with TNF-α and incubated with NCI-H292 cells separately: the neutrophil supernatant up-regulated mucin MUC5AC mRNA expression and subsequent MUC5AC protein synthesis; the time sequence was similar to previous reports of neutrophil release of ROS (29). In contrast to the supernatant, the activated neutrophils themselves did not stimulate MUC5AC synthesis. The reason for the lack of response of activated neutrophils could be due to the timing of the studies or it could be due to lack of adhesion of the neutrophils to NCI-H292 cells. Because previous reports showed that neutrophil adhesion potentiates the oxidative burst in neutrophils (31), it is possible that more potent mucin synthesis caused by neutrophil-dependent oxidative burst might exist when neutrophil-epithelial cell adhesion occurs. Cigarette smoke is another important source of oxidants and may play a role in the production of mucins in airways in chronic obstructive pulmonary disease. Because EGFR activation by interaction between EGFR with its ligands has been shown to cause MUC5AC synthesis (18), we examined whether activation of EGFR is required in MUC5AC synthesis induced by H2O2 or by supernatant of activated neutrophils. Both H2O2 and supernatant of activated neutrophils induced increased EGFR tyrosine phosphorylation, and selective inhibitors of EGFR tyrosine kinase completely blocked both EGFR tyrosine phosphorylation and MUC5AC synthesis caused by H2O2 and by the supernatant of activated neutrophils; a selective PDGFR tyrosine kinase inhibitor (AG1295) and a negative control for tyrphostins (A1) were without effect. These findings implicate EGFR tyrosine phosphorylation in mucin synthesis induced by H2O2 and supernatant of activated neutrophils. EGFR tyrosine kinase has been shown to be activated by two distinct processes. First, the binding of EGFR ligands to EGFR activates the intrinsic receptor tyrosine kinase and induces tyrosine phosphorylation (32). Second, there is increasing evidence that tyrosine phosphorylation of EGFR can be activated by a ligand-independent mechanism (ı̀transactivationı̂); EGFR transactivation occurs with various stimuli such as oxidative (H2O2) (16, 33), ultraviolet (34), and osmotic (34) stress, stimulation of G-protein coupled-receptor by endothelin-1, lysophosphatidic acid, and thrombin (35), m1 muscarinic acetylcholine receptor (36), and growth hormone (37). To analyze further the mechanism by which supernatants of activated neutrophils induce EGFR tyrosine phosphorylation, we examined both ligand-dependent and ligand-independent EGFR pathways. To test the ligand-dependent pathway of EGFR tyrosine phosphorylation, we used two different approaches. First, we measured TGF-α in the supernatant of activated neutrophils and found that the supernatant did not contain measurable amounts of TGF-α, a finding compatible with previous reports that showed that neutrophils only contained low concentrations (2.5 pg/106 cells) of TGF-α (38). In fact, the effect of supernatant from activated neutrophils on MUC5AC synthesis was as potent as the effect of 1 ng of TGF-α, which was 400-fold higher than the amount of TGF-α found in neutrophils. There is still the possibility that other ligands for EGFR such as heparin-binding EGF-like growth factor, amphiregulin, and betacellulin, which have not been reported in neutrophils, may affect mucin synthesis caused by supernatant of activated neutrophils. Second, we performed blocking studies with neutralizing Abs of EGFR ligands. Pretreatment with neutralizing Abs to EGF and TGF-α failed to inhibit MUC5AC synthesis caused by the supernatant of activated neutrophils. These results suggest that neutrophil supernatant-induced MUC5AC synthesis was not due to the secretion of EGFR ligands (TGF-α and EGF) by neutrophils. Third, we performed inhibition studies with antioxidants, because ROS are known to be released by neutrophils during activation. We found that an antioxidant N-acetyl-l-cysteine, scavengers of free radicals (DMSO and DMTU), and SOD inhibited MUC5AC synthesis by the supernatant of activated neutrophils, implicating oxidative stress in this response. In the present studies, we showed that ligand-induced EGFR tyrosine phosphorylation and mucin synthesis were not affected by antioxidants and that MUC5AC synthesis induced by supernatant of activated neutrophils was inhibited by antioxidants. From these results, we conclude that MUC5AC synthesis induced by supernatant of activated neutrophils is oxidant dependent. Although ROS are known to be produced by activated neutrophils, there is the possibility that the supernatant of activated neutrophils may contain factors that induce ROS production by NCI-H292 cells. Interestingly, it has been reported that an oxidative burst induces fibroblasts to synthesize and release TGF-α during acute inflammatory lung injury in vivo (39). Thus, neutrophils could induce MUC5AC synthesis via both ligand-dependent and ligand-independent activation of EGFR in vivo. The mechanism by which oxidative stress activates EGFR tyrosine phosphorylation is unknown. However, it has been speculated that inhibition of protein tyrosine phosphatase or the activation of intracellular protein tyrosine kinase such as Src might be involved in oxidative stress-induced EGFR phosphorylation (40). Because the MEK-MAPK transduction pathway is known to be downstream of EGFR activation and because a selective inhibitor of MEK, PD98059, is reported to inhibit MUC2 gene expression induced by Pseudomomas aeruginosa (41), we examined the involvement of MEK-MAPK transduction pathway in mucin MUC5AC synthesis induced by both ligand-dependent and ligand-independent activation of EGFR. Similar to EGFR tyrosine phosphorylation, H2O2, supernatant of activated neutrophils, and TGF-α induced increased activation of p44/42mapk, effects that were blocked by PD98059 and by BIBX1522. Furthermore, PD98059 blocked MUC5AC synthesis induced by H2O2, by supernatant of activated neutrophils, and by TGF-α, without blocking EGFR tyrosine phosphorylation, implicating MEK-MAPK as downstream of the EGFR transduction pathway in causing MUC5AC synthesis. Other stimuli (e.g., P. aeruginosa) may also cause mucin synthesis via the EGFR cascade. Oxidative stress is a central feature in airway inflammatory diseases, and recruited neutrophils are one of the important origins of oxidative stress in airways. Present studies show that recruited neutrophils act as regulators of epithelial cell differentiation via oxidant-dependent, ligand-independent activation of EGFR, up-regulating mucin MUC5AC gene and protein expression in airway epithelial cells. Because MUC5AC has been shown to be an important mucin in airway epithelium (19), which is present in respiratory secretions (20), inhibition of the EGFR signaling pathway and antioxidants are proposed as therapies in hypersecretory airway diseases. Proof of concept in humans will require testing in patients with these diseases. We thank Boehringer Ingelheim for providing BIBX1522 and Dr. Carol Basbaum for supplying the human MUC5AC probe. ↵1 This work was supported in part by National Heart, Lung, and Blood Institute Program Project Grant HL-24136. ↵3 Abbreviations used in this paper: ROS, reactive oxygen species; EGFR, epidermal growth factor receptors; MEK, mitogen-activated protein kinase kinase; MAPK, mitogen-activated protein kinase; PDGFR, platelet-derived growth factor receptor; DMTU, 1, 3-dimethyl-2-thiourea; SOD, superoxide dismutase; PAS, periodic acid-Schiff. Rao, G., N. 1996. Hydrogen peroxide induces complex formation of SHC-Grb2-SOS with receptor tyrosine kinase and activates Ras and extracellular signal-regulated protein kinases group of mitogen-activated protein kinases. Oncogene 15:713.